Twenty-six faculty members from a cross-section of campus recently completed the inaugural Faculty Leadership Institute at EKU. 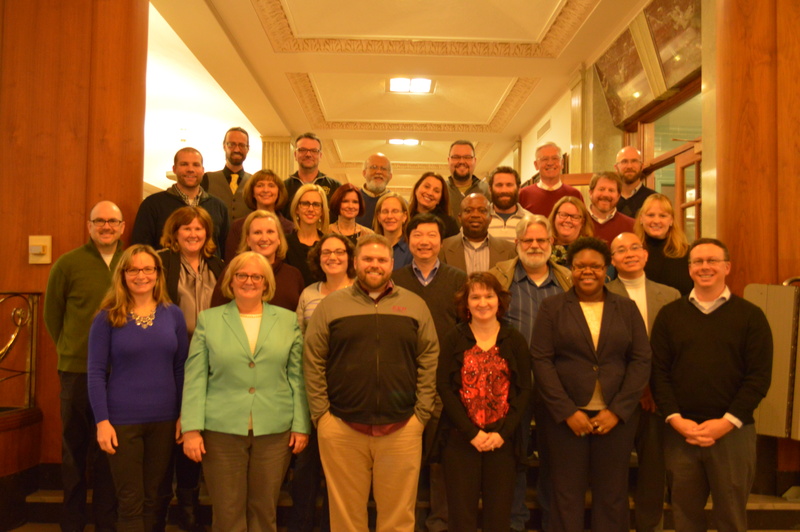 The two-day institute “focused on practical skills that can enhance leadership across campus,” said Dr. Russell Carpenter, executive director of the Noel Studio for Academic Creativity and co-chair of the 2017 institute with Dr. Sara Zeigler, interim dean of the College of Arts, Letters, & Social Sciences. The Institute planning team “took advantage of the expertise held by highly effective faculty leaders on campus.” Presenters included Shirley O’Brien, Bob Brubaker, Betina Gardner, Tiffany Hamblin, Yoshie Nakai, Lynnette Noblitt, Sheila Pressley, Jerry Pogatshnik, Amy Thieme and Garett Yoder. The inaugural class of participants, with representation from every academic college, included Ogechi Anyanwu, Dominic Ashby, Mike Austin, Ryan Baggett, Julie Baltisberger, Michael Bradley, Christine Carucci, Marco Ciocca, Anne Cizmar, Jennifer Fairchild, Gregory Gorbett, Karen Hopkins, Gill Hunter, Sandy Hunter, Lisa Kay, Ida Kumoji-Ankrah, Michael Lane, Jim Larsgard, Amy Marshall, Nicola Mason, Keri New, Minh Nguyen, Randi Polk, Donghui Quan, Matthew Sabin and Rebekah Waikel. Information about the 2018 FLI will be posted later this year at studio.eku.edu/faculty-leadership-institute. Carpenter expects the application for the 2018 institute will be posted on the site by Fall 2017.